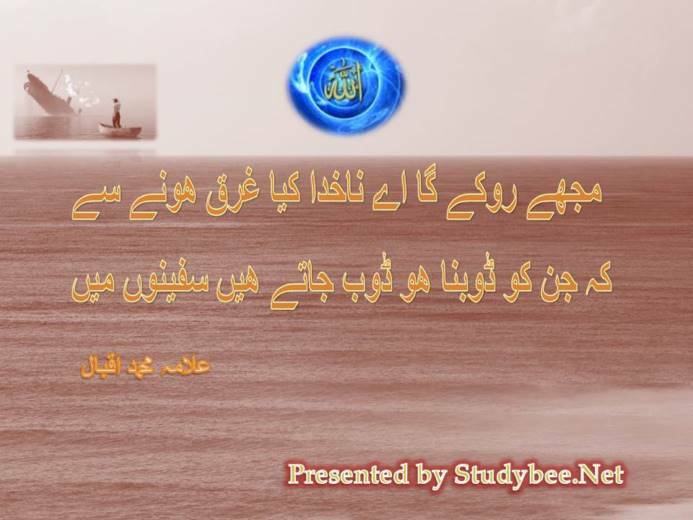 Iqbal Poetry of Khudi, self respect and high moral standards, carries deep and significant meanings in it. The theme of Khudi has been elaborated by Allama Muhammad Iqbal in many of his verses. Khudi, self respect, is presented as the attainment of highest moral standards. Allama Iqbal advises Muslims to raise their level of morality and virtue so that God Almighty may judge them as true Muslims. Iqbal goes a step forward and asks the Muslim brothers to please God with their actions. Iqbal has intents to play upon the theme that Muslims should not submit themselves to fate and circumstances; they are above fate, if they are true to their faith and belief. Allama Iqbal, a politico-religious poet, has directly referred to the flight of Muslim thought and conviction. For Iqbal poetry of Khudi, Muslims should devour whatever the holy Quran demands from the Muslims. When he sees a hypocrite Indian Muslim society, it hurts the feelings of the poet. He does not expect Muslims to go astray. In many of his verses, Iqbal taunts Muslims for they have forgotten the right path. For instance, in Shikwa and Jawab e Shikwa Iqbal shows the lost state of Muslims.